Ever since I first saw a photo of Neuschwanstein Castle surrounded by bright autumn leaves, I knew I had to visit it during that time of year. 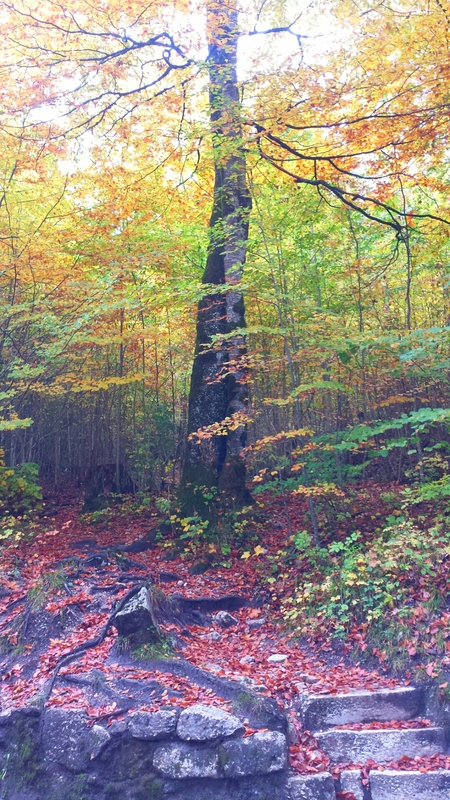 When I booked my trip to Germany, I purposely researched the time of year that the autumn foliage would be at its peak, so that I could be sure to time my visit with the season’s most gorgeous views and colours. Being on the top of most people’s German itineraries, you can only imagine how jam packed Neuschwanstein Castle gets with tourists every year, especially in the summer months when tourism is at its peak in Germany. 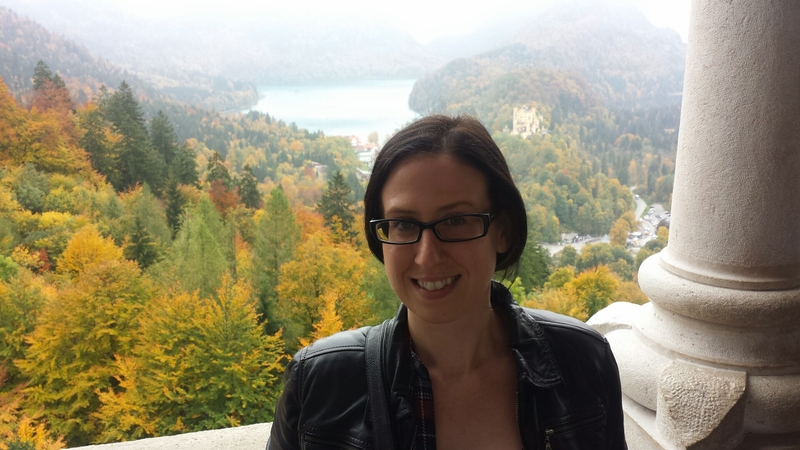 I think it’s safe to say that Neuschwanstein Castle is the most famous castle in all of Europe, so travelling during off season was also a plus for me, as I’d be avoiding the massive crowds. Located high up in the German Alps in the tiny village of Füssen, Neuschwanstein Castle’s grand facade is visible as soon as you make your way further into the town’s main square. 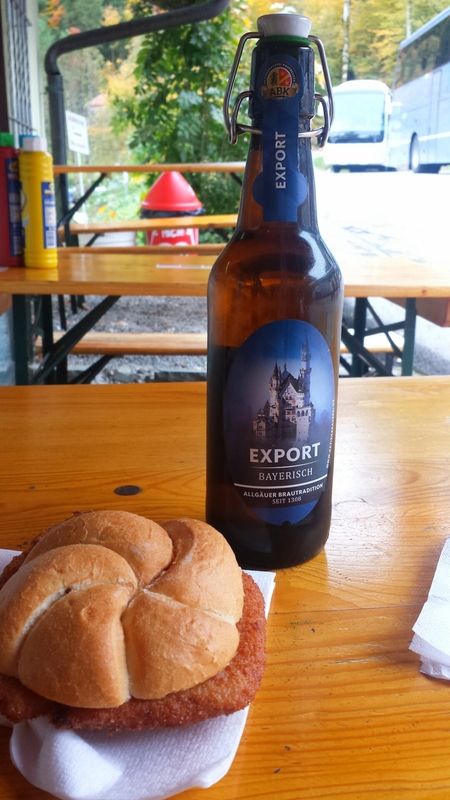 To access the castle, you must first walk up a paved hill through the Bavarian forest for approximately one mile. 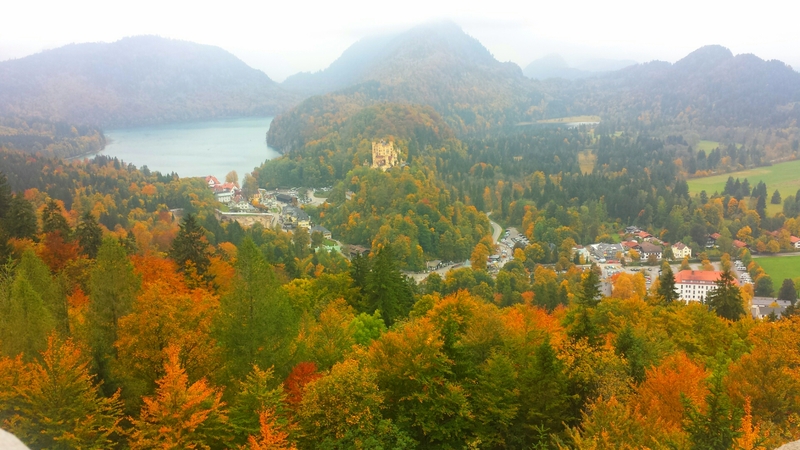 The hill gets slightly steeper as you inch closer to Neuschwanstein, but the colours of the autumn foliage takes your mind off of the climb as you are surrounded by the beauty of nature and breathe in that fresh mountain air. Neuschwanstein Castle was built by King Ludwig II of Bavaria, also known as the “Fairy Tale King.” He had an obsession with building castles at a grand scale, one always bigger and more beautiful than the last. King Ludwig II was a great admirer and supporter of the world-renowned composer, Richard Wagner. The word, Neuschwanstein literally means “New Swan Castle” referencing of “the Swan Knight,” which was one of Wagner’s characters. As I got closer to the castle and higher into the Alps, a thick fog started to slowly roll over the mountain tops and give the view an even more beautiful look. The colour of the leaves were popping out from the dewy, early morning fog and gave the surrounding area such a dreamy look. It honestly didn’t look real. It looked like something straight out of a fairy tale, which is probably why Walt Disney used Neuschwanstein Castle as his architectural muse for Cinderella’s Castle. As I approached the entrance for Neuschwanstein, there was a lineup to get in, but it wasn’t overwhelmingly busy, which was perfect. 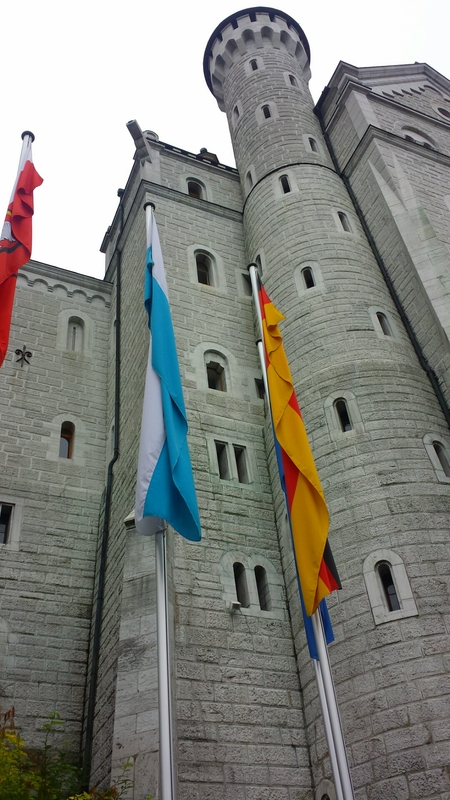 Everyone had a set time to enter the castle in groups of 20-30 and were guided through the castle, room by room and given a historic rundown on the castle, King Ludwig II and about the surrounding area of Bavaria. I must note that there is absolutely NO photography allowed INSIDE Neuschwanstein Castle, but there are windows throughout the corridors that are opened, so you can sneak a few photos of the stunning views of the countryside below. Nobody said you couldn’t take photos of OUTSIDE from within the castle, right? Sneaky, sneaky! 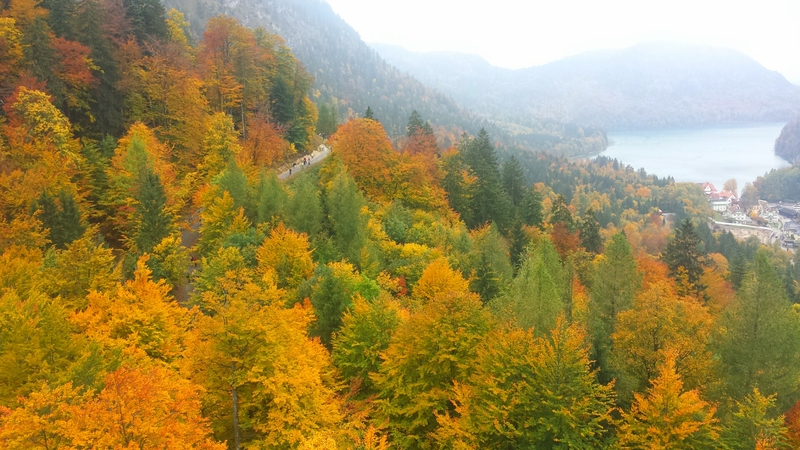 As I made my way onto the back balcony area of Neuschwanstein, I literally gasped out loud at the sight I saw. 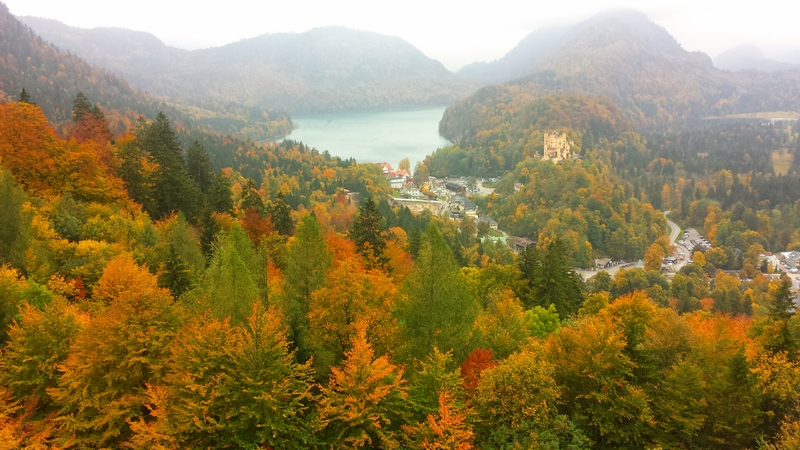 There I was, standing in the Bavarian countryside at Neuschwanstein Castle, surrounded by the rich golden yellows, bright fiery orange and crimson red hues of the autumn foliage. Check one off the bucket list, right there! It was one of the most breathtaking views I’ve ever laid my eyes on. From this view, you could see the pathway hidden in the forest that we had walked up to get to the top. It looked a lot higher from the height of the castle. 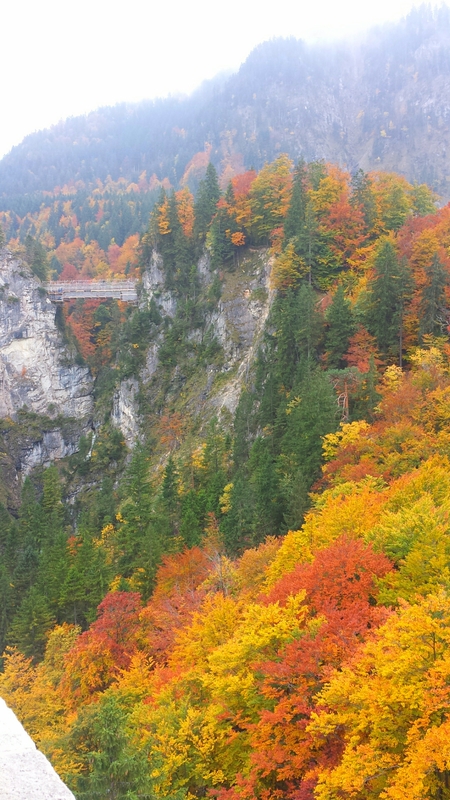 You could also see the Marienbrücke, an iron-suspension bridge over a deep canyon to my left. The bridge was under construction the day of my visit, so nobody could access it for that famous view of Neuschwanstein that almost everyone and their mother has. 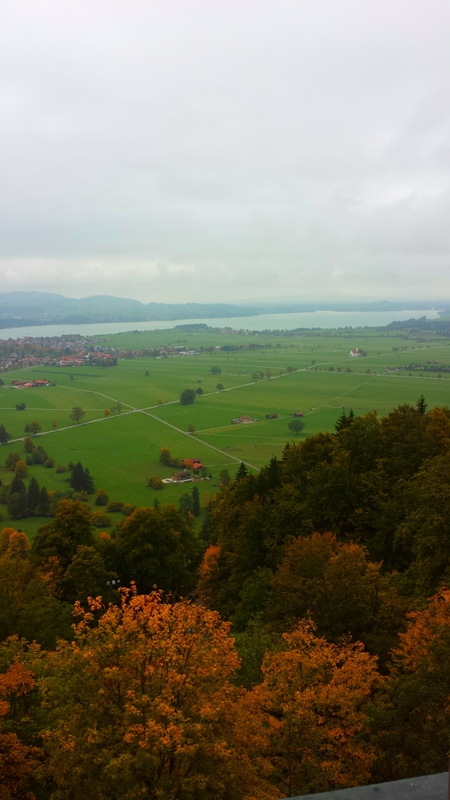 From the lookout area of Neuschwanstein Castle, you can also see Hohenschwangau Castle, or Schloss Hohenschwangau, which is a 19th-century palace in southern Germany. It was the childhood residence of King Ludwig II of Bavaria and was built by his father, King Maximilian II of Bavaria. King Ludwig II would later go on to build the Neuschwanstein Castle, which he apparently only got to live in for 9 days before his mysterious death. There are many different stories that surround King Ludwig’s death. Whichever one you choose to believe is up to you. 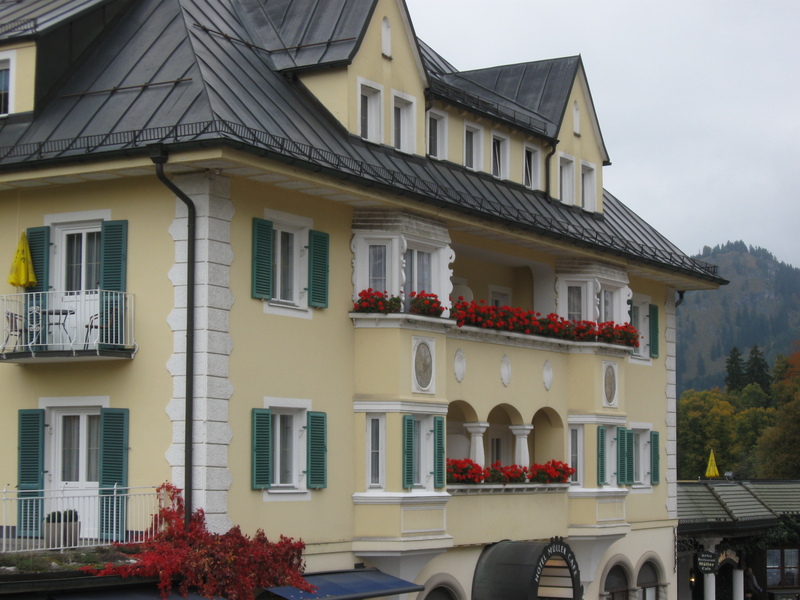 Once the tour of the castle was complete, I made my way back down the massive hill in order to meet up with my bus that would take me back to the Füssen train station. 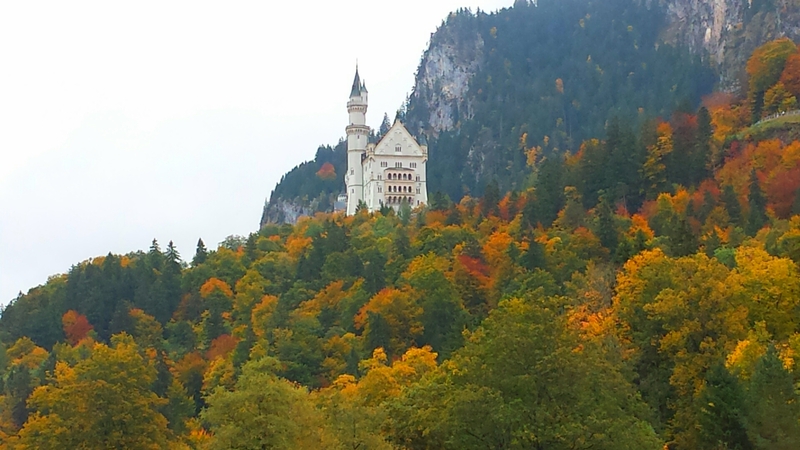 I highly suggest that everyone visits Neuschwanstein Castle during the autumn at least once in their life. It certainly does live up to the hype as one of the most beautiful castles in Europe. 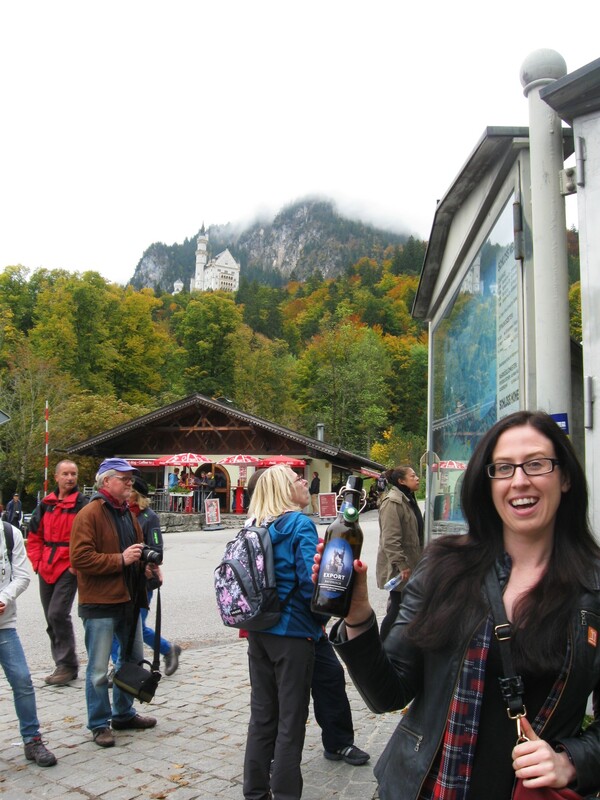 A trip to Neuschwanstein will definitely leave you in awe and bring out your sense of imagination and wonderment. Shouldn’t every fairy tale do that? Here is and interesting link to check out if you’re interested in the mysterious death of King Ludwig II. When exactly did you go there? 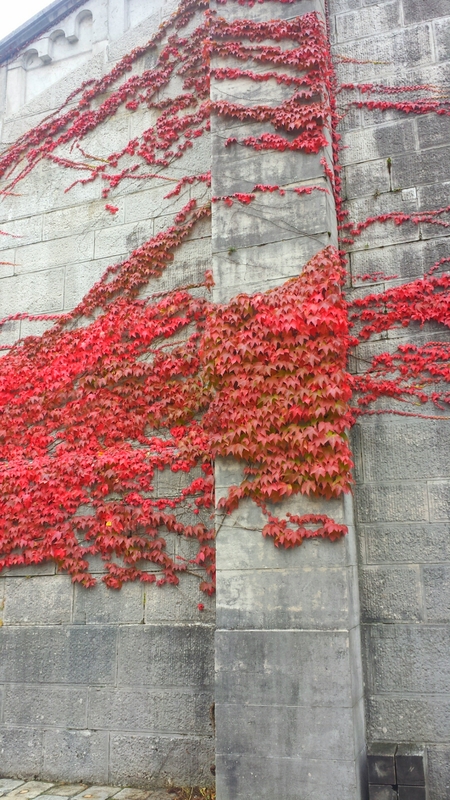 I wanted to visit this also during peak of autum. Thanks in advance.